Hi Lovelies! Hows was your weekend? Mine was spent dancing the night away at a friend's casual outdoor wedding reception. And now that I'm home I'm just taking a few moment to wind down before the work week starts back up. But, I wanted to get caught up on outfit pics and share some of the recent H&M goodies that I purchased on my LA trip--I'm absolutely in love with all of the pieces! Loving the necklace layering in the first look! Your outfits are always so put-together, Yasi! Love them all. I love all your looks, especially your work looks! You make blazers look so easy to wear, I'll have to try one now! Love your outfits as always!! I look nothing like you when I'm at work. I prob need to work on that. That F21 polka dot skirt is too cute! love your outfit, you're such an inspiration! Thank you for being so cute & posting all your outfit choices. I have been stuck in the jeans & a tshirt phase for way too long! 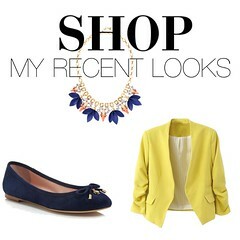 I love that you post where you bought the clothes so I can slowly update my wardrobe! I have the leopard flats and they are so painful on my heels and I even got a 1/2 size bigger than I usually wear. short skirt and a looong jacket. Q&A session-- I mustache you a question!